Have you heard of France’s wonderful Cannard a l’orange? If you do I bet you must be as fond of it as I am. Time for a BBQ version isn’t it? 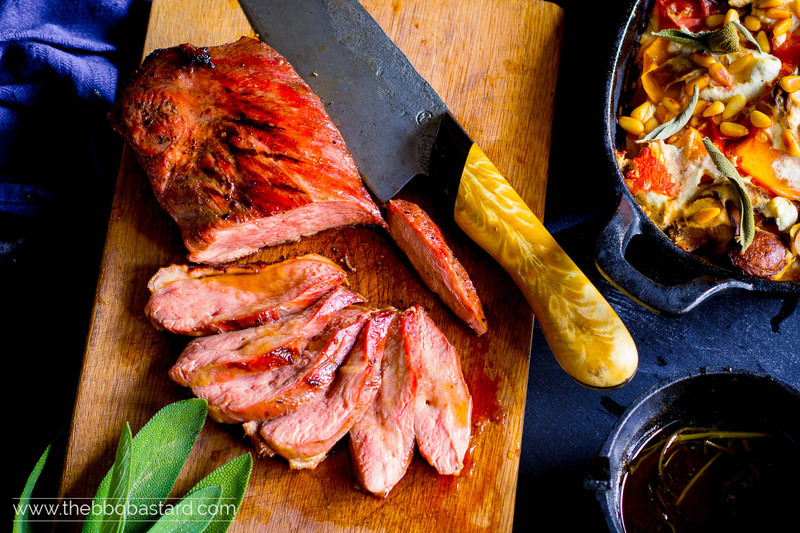 The smokey orange glazed duck breast is my twist on this classic. With a homemade glaze and a sage twist this smokey duck breast is a perfect piece of heaven to serve on a classy sunday meeting. Slice it up and add it to a salad and you might even use it as a starter for the holidays. Are you ready for this? Disclosure: "This post might contain Affiliate links. All opinions are my own." The process of smoking a duck breast is as hard as getting control over your temperature. 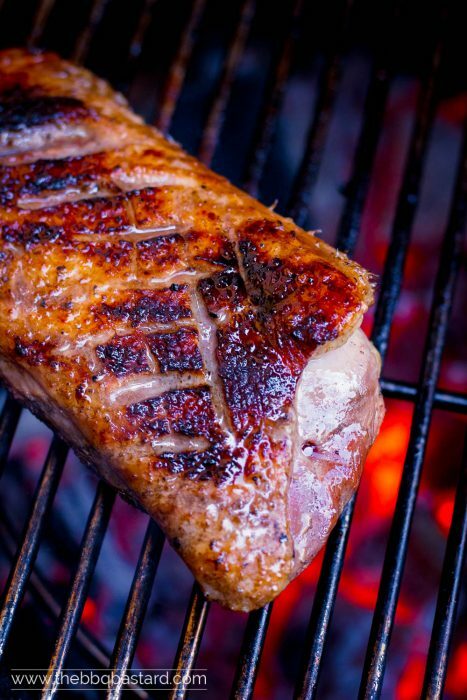 Once you’re able to stabilize the heat of your grill you can easily smoke this Orange Glazed Duck breast. Unlike this recipe (click here) for cold smoked duck prosciutto, the smokey orange glazed duck is “hot smoked”. At least what you call hot. Preferable temperature for the smoking of a duck breast is 80°C or 120°C maximum. The lower the slower it’s cooking and the longer the breasts can catch some smoke. To obtain these low temperatures you need an indirect cooking zone. 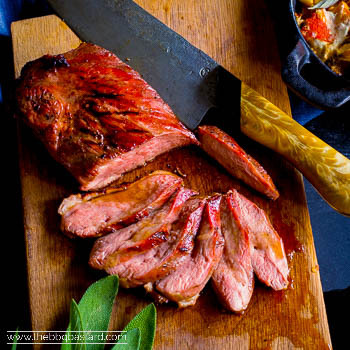 To get yourself an indirect cooking zone and get the right temperature to smoke an orange glazed duck breast you might need either a water smoker or a Kamado with heat deflector. In both BBQ’s the radiation heat is deflected by either the water pan or the platesetter. There are other options like pellet smokers or chuck wagons but I never used these. When using a water smoker make sure you don’t add to much coals (this is a bit of a search in the beginning). A kamado is easier to control. You only need to lower the heat by opening the vents to a strict minimum for are flow. We are talking about milimeters on the bottom side and a half cm. (max!) on top. The beautiful flavor of the duck combines well with orange. The fat dripping all over the duck breasts is leading to insane flavour profiles. But you might want to sear the breasts afterwards to crisp up the fatty pieces of the skin. Therefor we don’t add the glaze before grilling the breasts. After searing the fat side you can baste the breasts with your homemade glaze and let them sizzle for about two minutes each side. This process makes the glaze stick to the breasts and slightly caramellizes it for heavenly flavors. Make sure you don’t burn the sugars of the glaze or it will turn bitter. 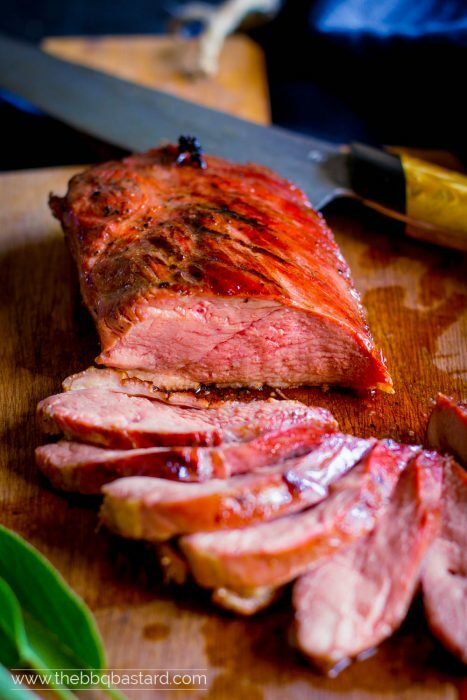 Hope you enjoyed this Smokey Orange Glazed Duck Breast recipe! Serving tip: try combining these breasts with the Tomato Tarte tatin or Pumpkin Lasagna. If you did I’d be happy to hear and see all about your session! If you’re not sure about a part of this recipe please give me a shout! I’d be happy to help you out. Oh and don’t forget: “Sharing is caring”. Cannard a l'Orange. I don't know if it's known around the world but it should be! This french classic put in a new jacket. A smokey one! Instead of adding a orange sauce in the end I glazed a lukewarm smoked duck breast. #Heavenlyfood. Put the breasts fat side up on a cutting board. Score the fat without cutting the meat beneath. Rub the duck breasts with salt and pepper and put aside while preparing your kamado/watersmoker for an indirect session at low heat (80°C/180°F). Use the waterpan or heat deflector to protect your breasts from radiation heat. Toss a couple of wood chunks on top of the fire and wait until the smoke turns slightly blue. Put the duck breasts in the smoker and slowly smoke them until they reach an internal temperature of 50°C/120°F (about an hour). Melt the butter in a pan and let it simmer until it's turning brown (beurre noisette). Now you have a delicious nutty tasting butter. Bake the sage in this butter and quench with the other ingredients. Let the ingredients boil down until you get a sticky textured glaze. Turn up de heat of your BBQ to 200°C/400°F. Grill the duck breasts fat side down to crisp it up. Careful! The dripping fat can cause flare ups. Move the breasts to a cooler side when it occurs. Glaze the duck breasts with the orange glaze and grill 2 minutes on each side to caramellize the smokey duck breasts. Make sure you don't burn the sugars in the glaze! Serve with fried rice or the delicious pumpkin lasagna. Add some of the glaze to the lasagna to make the flavours blend well. Have a nice meal!